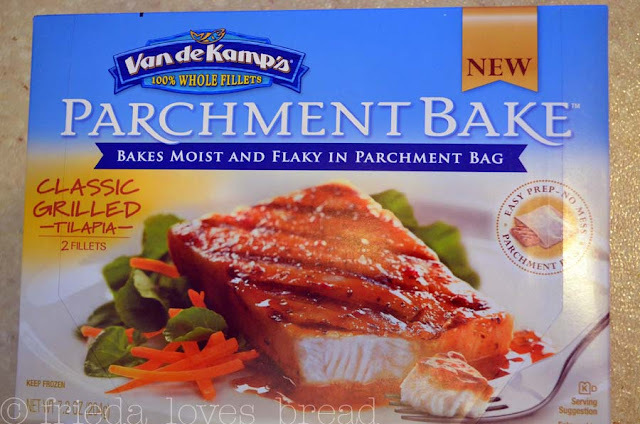 Frieda Loves Bread: Van de Kamp's New Parchment Bakes! 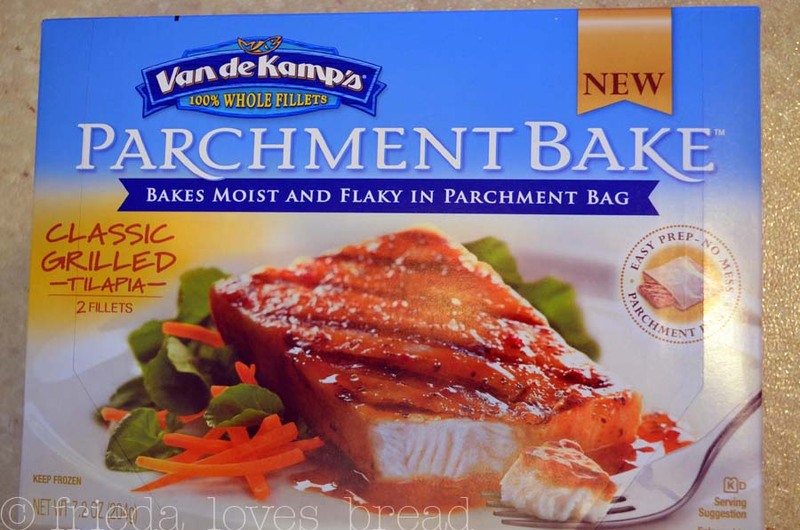 3 Van de Kamp's New Parchment Bakes! As part of the Foodbuzz Tastemaker program, along with Van de Kamp's, I was selected to try their new Parchment Bakes. Baking in parchment is not a new thing in the professional chef world or popular restaurants, but it is in the frozen seafood department. 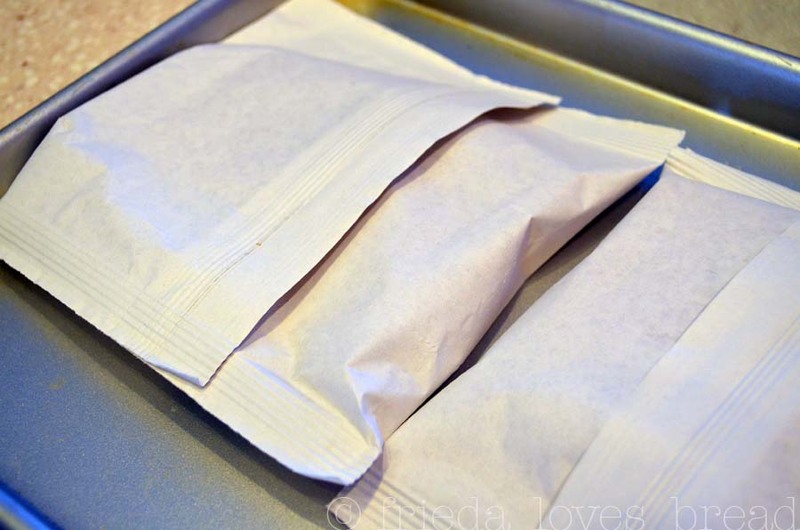 Baking in parchment paper ensures a moist and fully flavored dish. Parchment Bakes come in four flavors: Classic Grilled, Garlic Butter, Lemon Pepper, and Roasted Garlic. I opted to try the Classic Grilled as it looked like it was the mildest flavor. I was able to find this and the other flavors at my local Walmart for under $4. 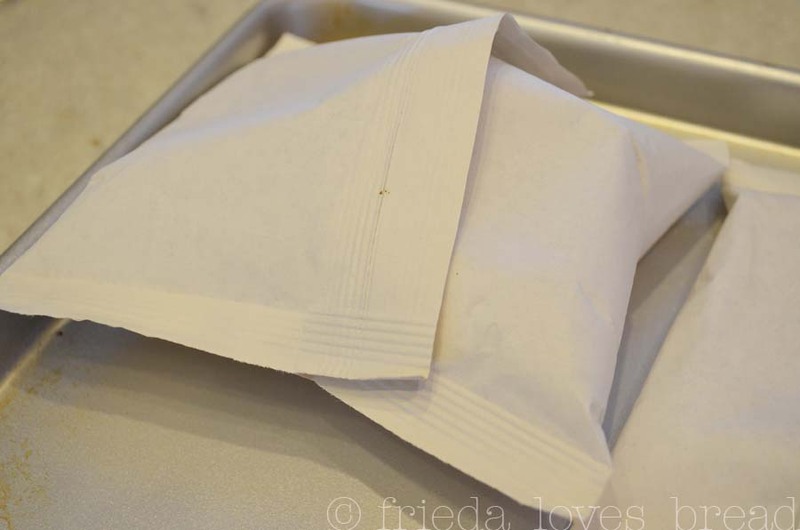 The box opens from the front and you will find two individual servings encased in heavy duty parchment paper. It does not include microwave instructions, only baking instructions. 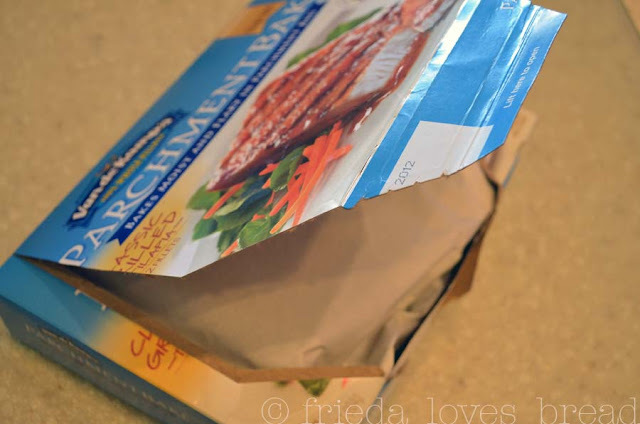 Put the parchment packets seam side up onto a baking sheet. Twenty-two minutes later, this is what I pull out of the oven ... a puffed up parchment pocket! I used scissors to cut the parchment open and grabbed a fork to test for doneness. Stick a fork in the middle and give it a slight twist. 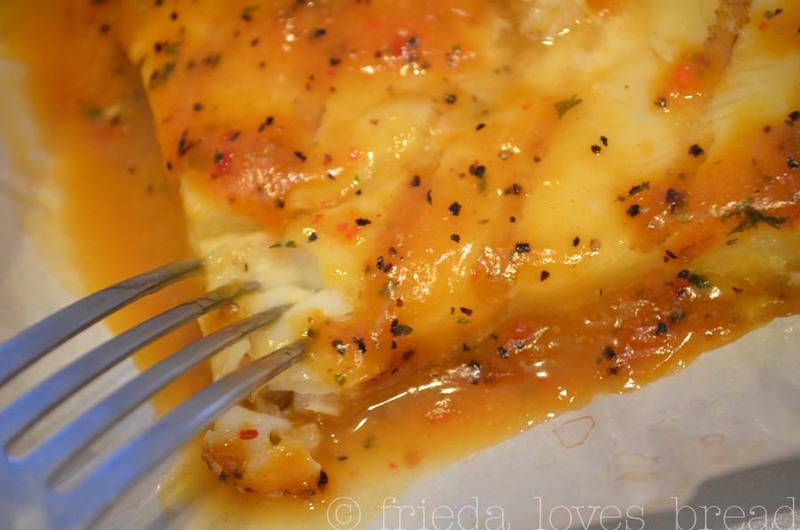 The fish should look opaque and flake easily. You can see how easily it flakes on this corner ... looks like it is done! Okay...you know how cooked frozen food NEVER looks as good as the picture on the box? Well, I think this actually looks BETTER than the picture on the box! I paired this with some rice and sat down with hubby for a taste test. Oh my. This is good. I mean, really good! The sauce is not sweet, more savory with mild spices (I detected a hint of cajun and paprika), with a kick of pepper. Plenty of sauce and the tilapia was very moist. This is a great way to have more fish in our diet, and at 80 calories per serving, we will definitely stock up! Hubby loved it ~ too bad it is not microwaveable ... but ... he can cook it at home and warm it up in the microwave, right? Want to try this? I bet you do. For a limited time, you can click HERE for a special Buy One, Get One Free coupon! Thanks, Foodbuzz and Van de Kamp's! I received a coupon from Foodbuzz and Van de Kamp's to try this product with no monetary compensation. All opinions expressed are entirely my own. Interesting! 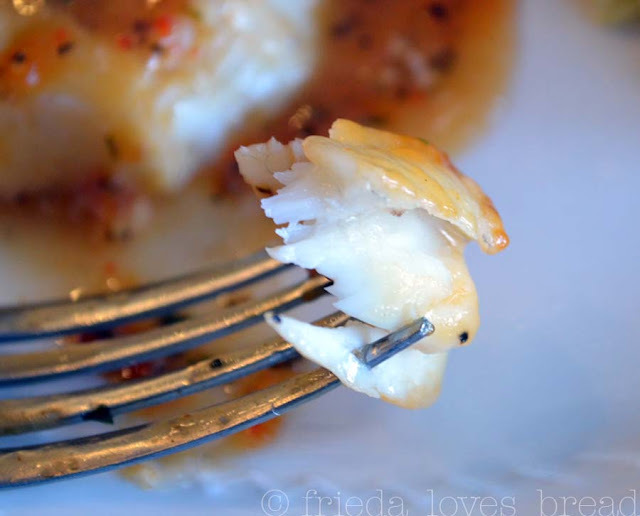 We love fish, and that sounds like an easy and delicious way to make it. I usually buy Van de Kamps and last week when the grocery had fish on sale we thought we would give it a try. We bought two versions. It was simple to prepare. Although it was ok it is not my favorite of the Van de Kamps products. I am going to print the coupons and give it another try. Which versions did you buy? We only got the original and hubby wants to try the lemon pepper. What is your favorite Van de Kamps product?